Pencil on archival paper, 9" x 12"
Grayson, our six-week old grandson, came to visit us over the weekend--his first big trip away from home. 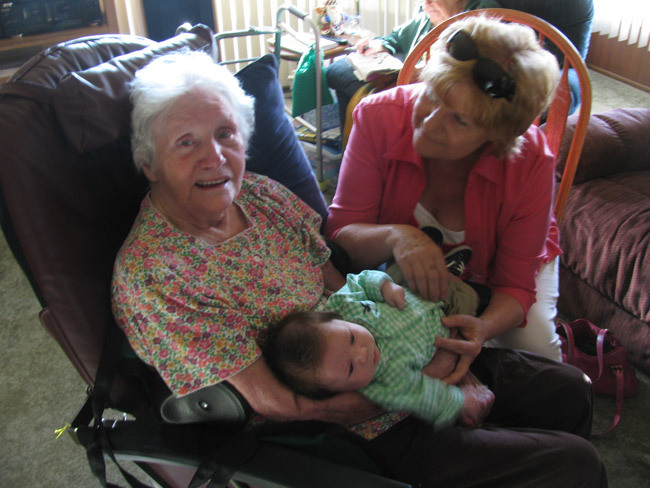 His great grandmother, aged 90, got to hold him--a special moment. He's beginning to smile now, so of course we all made fools of ourselves trying to coax a grin. He met other family members, including his great aunt, at brunch on Sunday, and we all made over him again. He didn't seem too impressed--slept through most of it. Grayson with grandma Brenda and great grandma Reta. Your drawing of Grayson is wonderful! How special that great grandmother got to hold him, too. These moments are prescious! Beautiful little fellow. Grayson's sweet mouth and hairstyle are wonderful! I can tell the artist has a crush on the little guy. Awww! Truly wonderful sketch and sweeet picture. Babies like Grayson are so blessed to be surrounded with love. What a sweet baby and a lovely drawing of him! He has got a great head full of hair too. What a wonderful time, thanks for sharing. Thank you, Egretta. Yes, very memorable for us that his great grandmother met Grayson. I tried to comment on your latest blog post, but Google won't let me--don't know what's wrong. Anyway, nice work! Hi Sam--thanks a lot! We all feel blessed having Grayson in our lives. I love how you described the photo, Rahina. Thank you for your sensitive comments. This beautiful drawing has such an "Old World" feel to it, as if done in silverpoint instead of graphite. Lovely child. Loving art. Thanks for your kind comments, lochinvarwelsh.